Growing up I always thought that bikes were kind of a universal thing. I didn’t understand how diverse and different one bike was to the next until I became an adult. In a way, I felt cheated that I didn’t know then what I know about their differences now. I could have had a much more rewarding experience overall, and I might have been a little more prone to take my bike for a joyride rather than sit around the house all day. Now that I’m all grown up and a bit of a self-proclaimed guru of mountain biking, I feel that I should introduce you to the mountain bike that I have been impressed the most with. I wrote this piece to show you some of the best features and functions of this bicycle, and hopefully, by the end of this Merax Finiss Mountain Bike review, you will appreciate it much like I do. This bike was created for the adventurer and the outdoor enthusiast. With comfort-minded design and easy-to-use features, you can conquer any kind of terrain for as long as you would like. It is no surprise that you are going to have to pick this bike up from time to time and move it around. Whether you are loading it up into a vehicle to take it to a nearby state park or just wheeling it out of your garage before you can hop on and start riding, weight matters. That’s one of the things that I really like about this bike, it is very light. This means that even if you are dainty and don’t have any kind of muscle mass to speak of, you can still move this bicycle around (and even pick it up) without a lot of force or effort. Moving away from classic steel construction, this aluminum build is easier to move around and not going to rust from being exposed to some undesirable elements. How the bike rides is another key benefit that I have truly been impressed by. With this aluminum fork, you don’t feel all of the bumps and unevenness of the terrain like you’d expect. Some bikes (especially those without any sort of suspension to speak of) are hard to ride on some of the more challenging trails because you get beat up pretty badly by the bike as it attempts to tackle the obstacles in your way. This Merax bike gives you one of the smoothest rides that you are likely to find in any mountain bike being sold anywhere in the world. 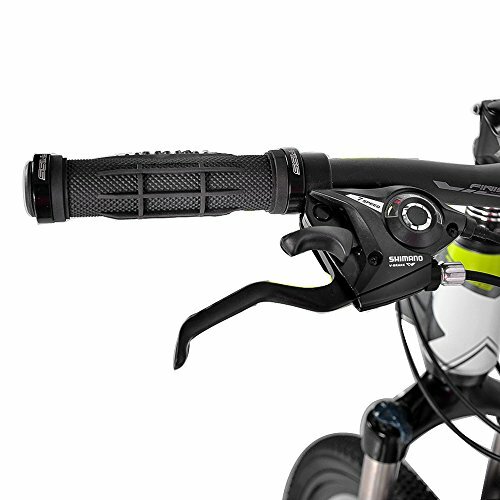 By distributing the impacts through the suspension fork, the force of the terrain is expelled before it reaches the seat and handlebars. This offers a more comfortable ride and enjoyable ride. Remember that universal bike that was discussed earlier? This is before I knew that bikes had various gears that you could choose from. My bike as a kid had go and (depending on the status of my handbrakes at the time) stop. But the more that I learned about speeds on bikes, the more I realized how innovative and impressive they actually were. But the more that I learned about speeds on bikes, the more I realized how innovative and impressive they actually were. If you wanted to make it a little easier on yourself or give yourself more of a physical challenge, you only have to seamlessly shift to that gear. 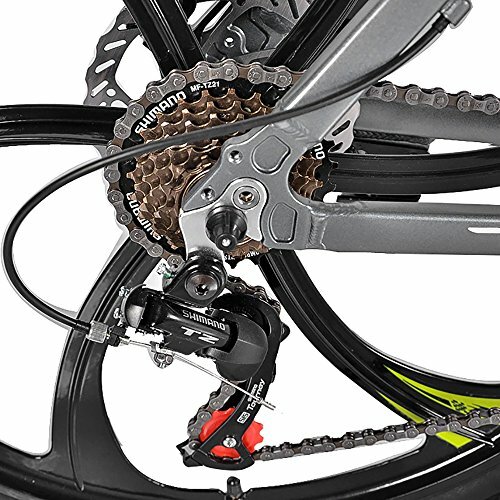 Speaking of shifting, you might be delighted to know that the integrated Shimano shifters offer you a quick and easy way to move from one gear to the next. 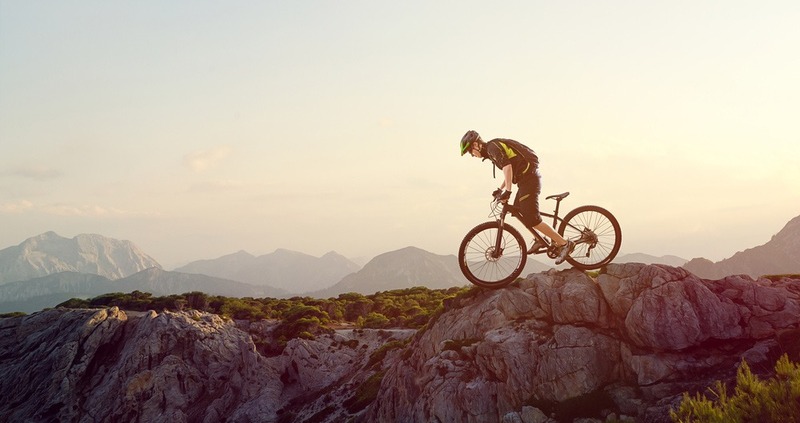 While this might not be breaking the design mold by any means, this is a look and functionality that you can expect from a mountain bike that you plan to keep busy. The easier it is to ride, the more fun you will have and the more that you will use it. Between the integrated shifters and the derailleur, anyone can become masters of the full potential of their bikes. The ergonomic layout of the shifters makes changing these gears accessible from where your hands naturally sit on the handlebars. 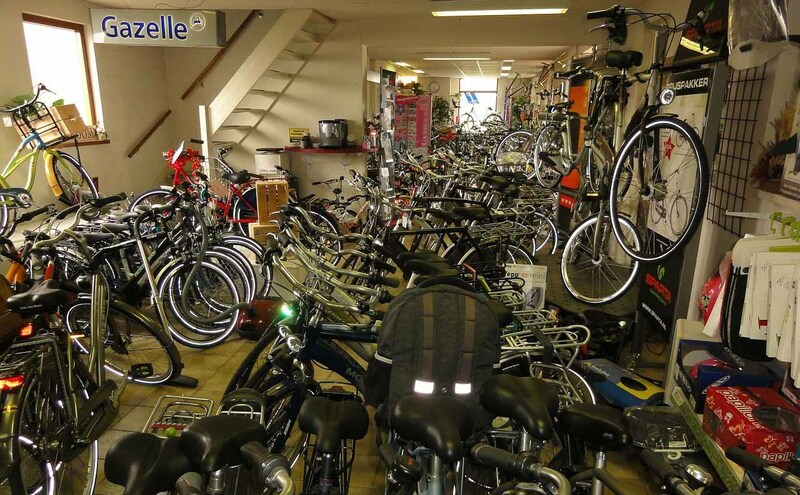 While the ride, speed and handling of a bike are incredibly important when you begin to search for a new bike to buy, another extremely important function is the ability to stop. While this is in no way uncommon to mountain bikes, the design of these brakes adds, even more, peace of mind. This will help you to feel more comfortable as you ride. 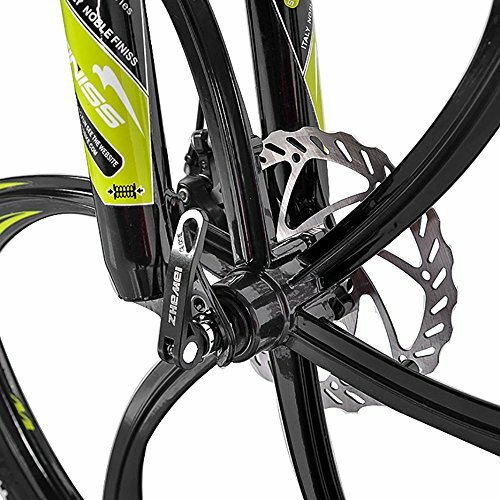 The brakes of the Merax Finiss bike are dual disc brakes, one on each wheel. This offers efficient and effective stopping power under any kind of condition. So no matter what kind of terrain you set out on, or in what type of weather conditions, this bike can stop you safely. Bike is lightweight and durable. A full 21 speeds offer a wide array of riding options. Comfort-focused features offer a smooth and simple ride. There are no sizes to choose beyond this one being reviewed. 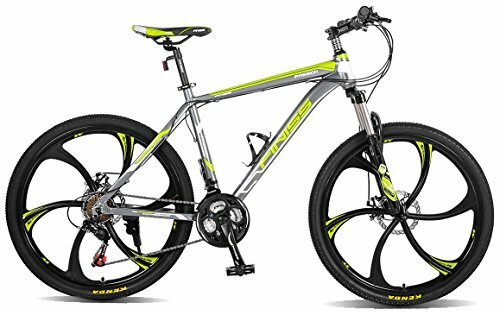 Is this bike good for a tall rider? Answer: This bike is ideal for anyone who is 5’ 10” or shorter. While taller riders are likely still able to ride this bike, it isn’t really constructed to be operated by someone who exceeds the aforementioned height. Does this bike need a professional tune-up before riding? 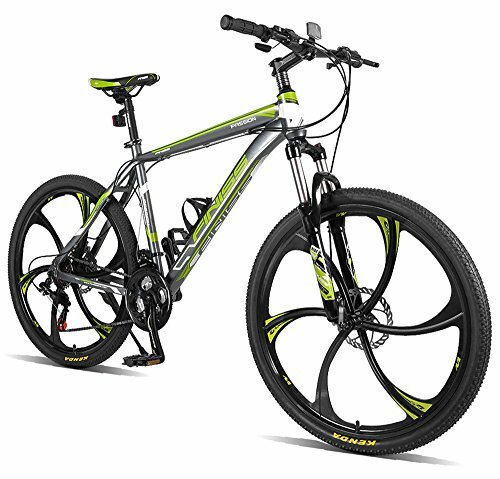 Answer: Unlike many of the higher-end mountain bikes out there, this one is a assemble and ride. While there are certainly no problems with getting your bikes checked out before you ride by a trained professional, this is in no way a requirement from the manufacturer. There are few mountain bikes that have impressed me as much as what you’ve just been introduced to with this Merax Finiss Mountain Bike Review. Not only does it feature all of the high-end design additions and functions that you have come to expect from quality bikes, but it does so at a reasonable price. While there are hundreds of high-quality bicycles that you can choose from all over the internet, you too will be uniquely impressed and ready to ride this impressive model from Merax.